Great quality kids overalls in 10 bright colors and multiple sizes. Perfect for babys, toddlers, boys or girls. The coveralls can be personalised with a name logo or message of your choice. 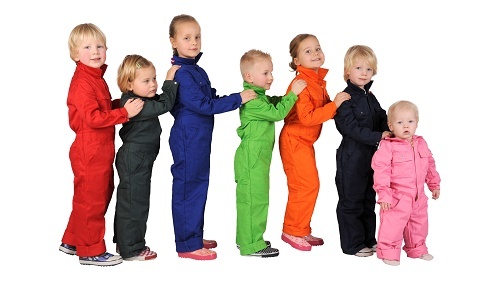 Sturdy colorfull childrens coverall to protect your clothes during messy times when helping mum or dad or playing outside. Encourage your kids to wear the suit to protect their clothes in the kitchen garden or playing outdoors. Our top selling children's coveralls are perfect for keeping kids clothes clean while having fun outside or help with work around the home. Smart, lightweight and durable these overalls are used at many places like farms, activity centres, day care centres as well for general home use. Let the children help you in your kitchen garden wearing their coverall. It keeps clothes protected from dirt, mud and more. Let them get dirty with a smile. Our bright coloured children's overalls are also available for adults and can be shipped worldwide. Good quality overall: 65% polyester and 35% cotton. Washable at 40 degrees, do not tumble dry. The overalls come with a consealed two way zipper, an elastic waistband, two flapped breast pockets, two side pockets, two slanted insets, a back pocket and a mechanic's pocket. could you kindly let me know the cost of the boiler suits please? In case you have any more questions, please feel free to contact me. Looking for little girls coveralls in tan.